Thanks to Hungry Girl my husband and I have discovered the joy of soy (Holy crap soy crumbles taste a lot like meat and have no calories and fat when compared to hamburger! ), the wonders of Laughing Cow cheese wedges (A whole wedge, the entire thing is only 35 calories?! ), and thanks to their product alerts my husband finally found a hot dog he could eat that I won’t beat him up about (Hebrew National 97% Fat Free Beef Franks, only 40 calories per dog and they taste so good!). And it’s that very same hot dog that features in something so wrong, so in violation of the natural order, and yet, is quite tasty. My husband love hot dogs. Left on his own they would most likely be his breakfast, lunch, and dinner. Before you say it, yes, I’ve seen him eat hot dogs while drinking coffee so hot dogs for breakfast aren’t out of the question. Anyway, on July 16, 2009 (a day that shall now live in infamy) I got my email from the Hungry Girl website. “Yesterday was National Hot Dog Day. Today is National Corn Fritters Day. We’re getting creative and merging the two. Happy Corndog Day, people! ” it started out. 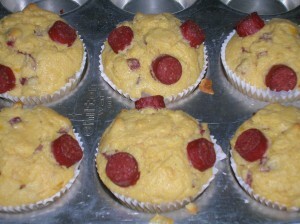 And then, the first recipe was revealed, the “Corndog Millionaire Muffins”. 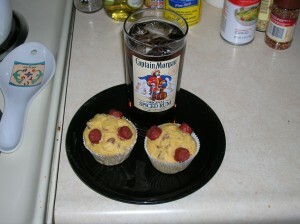 There was a brief discussion as to what to drink with a corndog muffin (Does it pair well with a red wine perhaps?). We decided that only an equally great violation against nature could be paired with this meal. So I made myself a rum and diet caffeine free coke using rum from my $50 bottle of 15 year old Rhum Barbancourt. It seemed like a sin to use such a good rum for a lowly rum and coke, but boy did it taste good! And the muffins, as wrong and evil as they are, tasted like corndogs. They look freakish and wrong, but they tasted just …. like …. corndogs. They tasted good and at only 160 calories a muffin their appearance is the only thing twisted and wrong. Want to become your very own Corndog Millionaire by making these muffins? Click here! Want to visit the awesome Hungry Girl website to get great low cal recipes and tips to buying yummy guilt free food? Click here.